„I had a farm in Tuscany….“ The famous line “Out of Africa” could just as well apply to this farm owned by the Mozzoni Paravicini Crespi family in Lucignano between Arezzo and Siena, only one hour south of Florence. At four hundred meters above sea level, this organic farm produces olive oil and raises the local white wide-horned cattle; only a part of its five hundred hectares is devoted to agriculture. The rest is covered with Mediterranean bush and woodland where the cattle can roam free and seek the shade in the summer months. The La Badia farm was acquired by the Mozzoni Paravicini Crespi family in the 1960’s. They already had a large organic farm in Northern Italy and a busy life in Milan. What they sought here was to create a bucolic ideal of a simple lifestyle in harmony with nature and the local farmers. 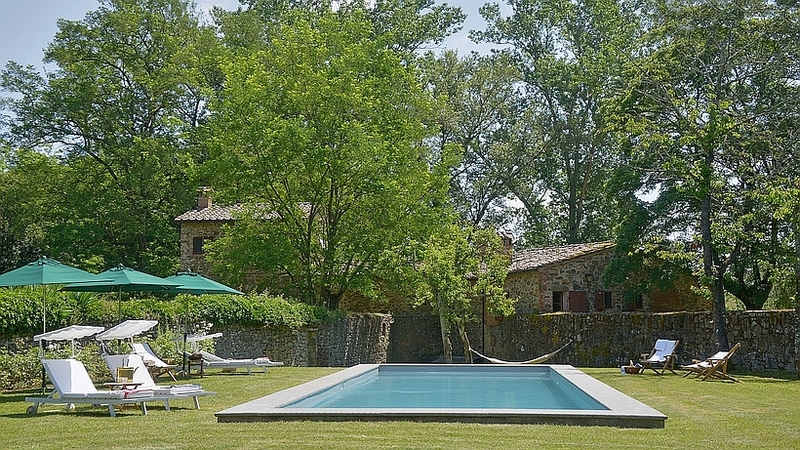 Scattered all over the farmland are fifteen farmhouses, one more lovely than the other, overlooking a magnificent Tuscan lanscape of rolling hills dotted with umbrella pines and cypress trees punctuating the horizon. The first farmhouse to be restored for guests is Il Mulino or the Mill. La Badia lies 30 km south of Arezzo. The closest village with shopping facilities 5 km from the estate is Lucignano, a typically Tuscan hilltop village famous for its streets arranged in a circle. Arezzo is the next largish town. You will not want to miss the frescoes by Piero della Francesca in the Basilica San Francesco. If you are at the Mulino on the first week-end of the month, you might also want to visit the antique market on the main square. Florence et Siena, Tuscany’s most important cultural milestones, are easy to reach from La Badia. A walk through the estate La Badia is an enriching experience which brings you closer to the surroundings. Just follow one of the paths that lead uphill from il Mulino. You will come past the main house of the estate, many yet to be restored farms, a small lake, wild animals and the famous longhorned Tuscan cows. The views stretch accross the estate towards the Orcia valley and the silhouette of the castle of Radicofani in the far back. Two excellent SPAs can be found in the surroundings. Rapolano Terme (18 km from La Badia). There are tennis courts in the next village Lucignagno at 5 km, and mountain bikes can be hired there. 2 mountain bikes are in the house, more can be hired in Lucignano. Thanks to the natural hot water springs in nearby Rapolano Terme (18 km) you can choose from two spas to treat yourself to mud baths, massages, facials and many other tempting treatments : Antica Querciolaia and San Giovanni.